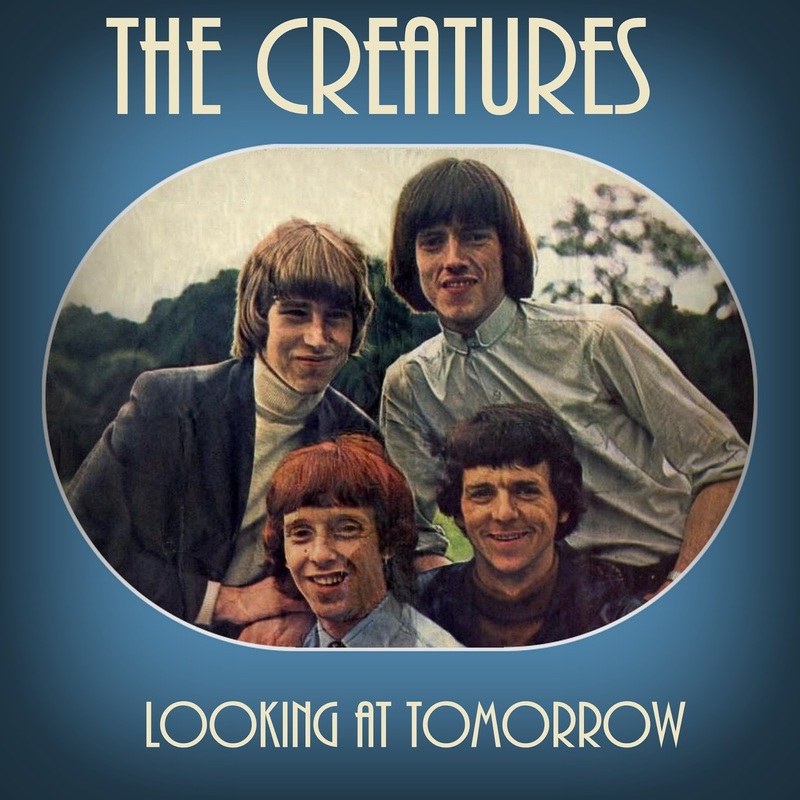 The Creatures were one of the key beat groups to emerge from Ireland in the 1960s. They were also one of the few Irish acts to attempt to by-pass the UK market and ambitiously aim straight for the US charts, and in the process they left behind a considerable recorded legacy which has been regrettably overlooked by the digital age. First there were The Hootenannys, featuring guitarists Jim Dalton, Bobby Kelly and Liam McKenna, bassist Frank Boylan and drummer Ray McDonald. 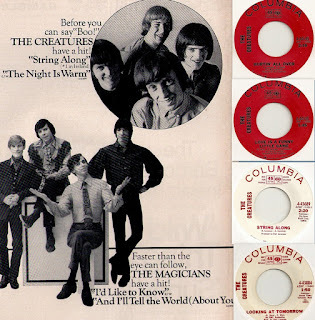 They issued just one single, pairing the Shadows-style instrumentals Fiona / 6.10 Special in 1964, with royalties donated to the ‘Conquer Cancer Fund’. 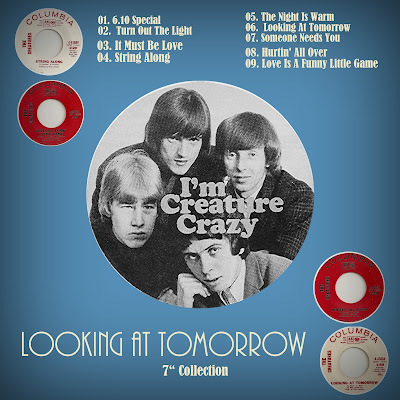 Jim Dalton was soon replaced by lead guitarist Brian Harris, and when Bobby Kelly left, McKenna, Boylan, McDonald and Harris renamed themselves The Creatures in April 1965. They quickly built a following and became a fixture of the Dublin clubs. They performed at the Locomotive Club in Paris in August 1965 where they impressed New York producer Neil Levenson of Columbia Records. Back home, Liam McKenna, Frank Boylan and Brian Harris stood out amongst a crowd queuing for a Rolling Stones concert at Dublin’s Adelphi Theatre on Abbey Street in September 1965, and were interviewed for the documentary film ‘Charlie Is My Darling’. Neil Levenson arranged a recording session at Advision Studios in London in late 1965, where the band recorded ten demos which earned them a one-year contract with Columbia Records USA. The band spent most of 1966 in the USA, where each of their four singles were originally issued during 1966 and 1967. The first three received a delayed release in Ireland and the UK on the CBS label, but their only chart hit was in Ireland with debut single Turn Out The Light, despite it being banned by RTE Radio Eireann. Neil Levenson wrote or co-wrote much of the band’s recorded material, with the notable exception of the sophisticated Barry Mann/Cynthia Weil song Looking At Tomorrow, and Someone Needs You - apparently written by Frank Boylan’s brother. Their sound on record ranged from hard R’n’B to pop ballads. 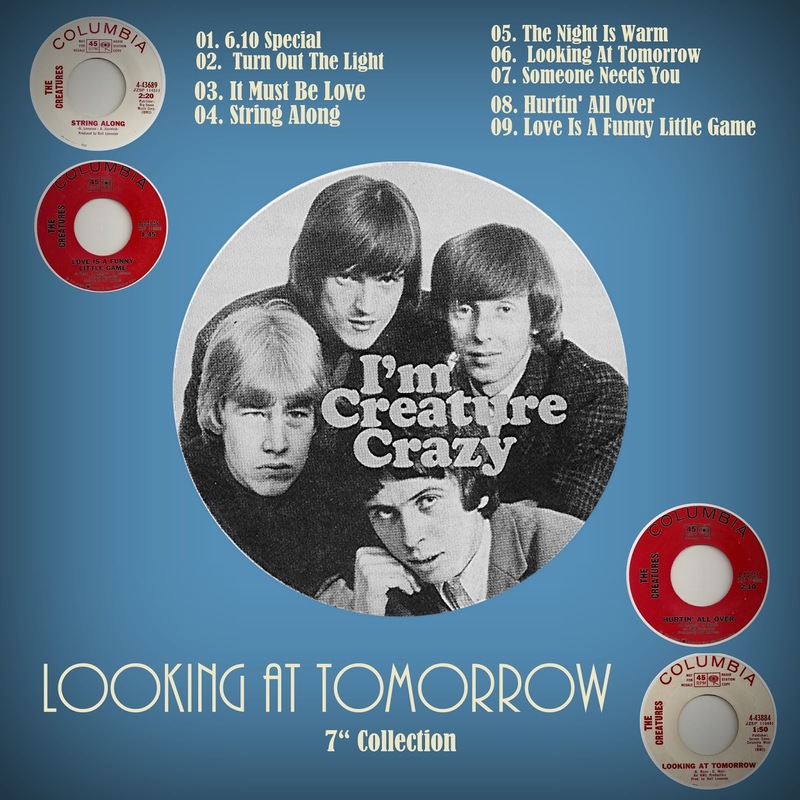 The American chart break-through never came however, and The Creatures returned to Ireland in late 1966 when Columbia chose not to renew their contract. They brought with them two more Neil Levenson demos which provided fellow Dublin group Paul & The Deep Set with their first two single A-sides. Ray McDonald left at this point and was replaced by Fran Byrne, formerly with soul bands Rockhouse and The Chosen Few. The Creatures went to Germany in April 1967 for an extended tour and on their return to Ireland in August, an altercation with UK customs brought them negative press attention at home. They finally split in September 1967 when Fran Byrne joined The Sands pop group, although they reformed for a one-off performance in March 1968. Frontman Liam McKenna played bass with pop group The Real McCoy between 1968 and 1971 (and sang lead vocals on a few tracks). Frank Boylan, Brian Harris and Ray McDonald reunited in early 1968 in blues band Ditch Cassidy & The News, who spent most of their existence touring Germany. In December 1969 Frank Boylan, with Ditch Cassidy, was arrested by French authorities on drug charges and again made Irish newspaper headlines for the wrong reasons. The two were released after ten days of fairly brutal treatment, their long hair forcibly shaved off. Boylan then joined folk-rock group Mellow Candle just long enough (1971-72) to play on their highly-regarded album ‘Swaddling Songs’, before also turning up in the Gary Moore Band and Chips. Liam McKenna and Brian Harris briefly reunited in The Gentry (1972-73), with Harris going on to The Cotton Mill Boys and Cat’s Pyjamas and McKenna spending a decade playing bass and guitar with The Memories (McKenna was last heard of in London many years ago and may have passed away, but no-one seems sure). In September 2006 three original Creatures – Frank Boylan, Brian Harris and Ray McDonald – were joined on-stage by Jimmy Faulkner for a reunion as part of the Ranelagh Arts Festival.